Wanted: Assistant to provide maternity cover for high-powered TV producer. Must be bright, creative, with killer instincts. Emma would do anything to work for the woman who has the job she wants. Carrie is at the top of her game, with a dream career, a baby on the way, and a handsome screenwriter husband. For Emma, with parents who don’t understand her ambition and a serious misstep behind her, this temp position might be her last chance. Carrie has given up more than anyone knows to get to the top of a ruthless business. She won’t give up this baby too. But with Emma filling in for her at the office, her perfect life starts to unravel. Her bank account is inexplicably overdrawn, her husband seems strangely distant and colleagues are all too happy to take Emma’s creative direction. Carrie finds herself dying to get back to work . . . until a letter left at her door changes everything. Trust and fear trade places in a love triangle that defies readers’ expectations at every turn. 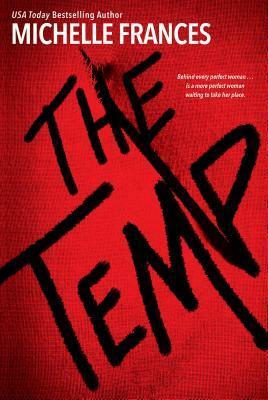 The Temp by Michelle Frances held a what I thought was a great plot. There was the suspense and some plot twists that I did not expect. But other than that, the story dragged out too much. The characters made the plotline more dramatic than it was. It felt like the drama parts were stretched as far as they could go. Think of a rubber band being stretched to its limits before breaking. That same concept was shown here. The relationships between the characters are the rubber band. The cover caught my interest to read this book. I had so many thoughts on how and where this book where end up…and it didn’t go in either of those directions. Michelle Frances caught me by surprise. Her writing is good…but this book just was not it for me. I love thrillers. J.T. Ellison, Karen Harper, Carla Neggers and many more thriller/suspense writers are some of my favorites. The Temp had some of the elements form these other writers’ books. It was entertaining, but it could have been done better.